Congratulations to Kevin for 16 years with the Rohn Industries family! 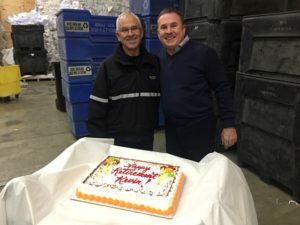 Kevin retired in December after 16 years with the Rohn Industries family. Initially, he joined Document Destruction Services, an organization that Rohn acquired a few years ago, and found his place doing what he loves, driving. From the whole team at Shred Right and Rohn Industries, we want to wish Kevin all the best in retirement! Infographic: Because Shredding Your Documents isn’t Enough. . .
What is happening inside U.S. Recycling bins? Infographic: Are you a target for Identity Theft? Have you scheduled your annual shred yet? “ Shred Right has been our company of choice for a number of years. As a bank, we have a large amount of data that needs to be taken care of properly and the folks at Shred Right take care of that.